Good morning and welcome. Happy Palm Sunday. 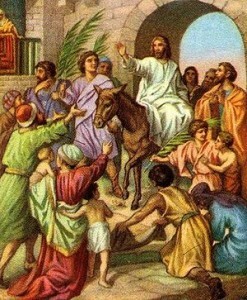 Today, we celebrate Jesus Christ's triumphal entry into Jerusalem. It marks the beginning of Holy Week and falls each year on the Sunday before Easter Sunday. Let’s hear our story now. The dusty roads leading into Jerusalem were filled with people, young and old, making the trip to celebrate to Jerusalem to celebrate Passover. Jonathan tugged on one side of his father’s cloak, while his younger sister Sarah pulled on the other, only a little lower. “Father, are we there yet?” Jonathan asked. “My feet hurt,” Sarah said. Mother interrupted, “Let’s stop here under this tree and rest for a while. We have time.” The family found the perfect spot. Mother set the water and food on the blanket. They all took off their sandals and rubbed their feet in the cool grass. “Do we have to walk much farther?” asked Sarah. “What’s a prophecy?” Jonathan asked. With the help of their father, Jonathan and Sarah cut down the largest branches they could handle. Suddenly this trip didn’t seem so long anymore. Jonathan felt strong and important carrying an armful of palms. Sarah enjoyed collecting beautiful flowers to toss on Jesus’ path. They continued on their journey with a joyful heart and a spring in their step. In all the years that the disciples had been with Jesus, they had only seen him walk from place to place. So, you can imagine their surprise when Jesus asked for a colt. However, the two disciples obeyed. And sure enough, when the owner asked them why they were untying his colt, the disciples responded as they had been told, “The Lord hath need of him,” and the owner gladly let the men take him. The disciples brought the colt to Jesus and threw some of their clothes on it to make a saddle for Jesus’ triumphal entry into the city. What pride and joy welled up in the disciples’ hearts as they looked upon their Lord. True, he didn’t look like a king of the world. He wore no jeweled crown or royal robes. Yet, his face shined forth the kindness, goodness, strength of character and love of a true King. The disciples recognized “the Christ” in the “man Jesus”. Now, the word spread that Jesus was at the entrance of the city. The people began to crowd the road. Sarah, Jonathan and their parents worked their way through the crowd to the front of the path. Sarah placed her flowers on the road as others laid down their coats and palms to make a beautiful carpet to welcome their King. And then — Jesus entered. “But, Mother, he doesn’t look like a king,” said Sarah, somewhat confused. Let’s continue with our story now. Sarah and Jonathan listened as he spoke. “Father, what does Jesus mean?” asked Jonathan. The family watched as Jesus rode out of sight. Then they settled at their campsite. They quietly sat by the fire and pondered their experience with Jesus that day. Isn’t that a beautiful story of Jesus? Mother Mary tells us that Jesus was like a magnet that drew the people to him because he was full of divine love. He was a magnet of love! Let’s remember to send our love to Jesus each day and to receive the love he sends to us. Thank you for being here at our story and may your day be filled with the joy of the Christ. Permission is granted to copy and share this lesson in its entirety, including all copyright and contact information. This lesson may not be sold or used in any way to gain profit. Published by Montessori International. Copyright © 2017 Summit Publications, Inc. All rights reserved.